Aim for cute comfort wearing the Kate Spade New York® Felicia Sneakers. Metallic leather and glitter upper. Textured leather and rubber outsole. We can't currently find any similar items for the Felicia Sneaker by Kate Spade New York. Sorry! Super cute shoe. Very stiff. I brought these sneakers in silver for a concert. I wore them with a Tom Ford Glitter dress. They fit good, however the sneaker is hard. You should really think before wearing socks with them if you have any room in these sneakers, your feet will slide around, other than that they are perfect. Never have I loved sneakers like I love these shoes. So much sparkle and so fun. Super comfy. These are great! Good fit and comfy. I get tons of compliments when I wear them. 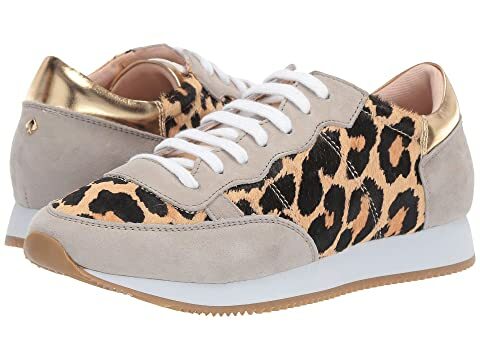 Purchased these sneakers, they came the next day...they fit perfect and they look so cute with what I am gonna wear the with....love love love them they fit true to size.